Each item in the kit has been chosen to ease what is often a daunting task . Desert Fox tyre ease tool. – This tool removes the possibility of pinching of tubes or tearing of tyre beads. Its unique design pushes the tyre back onto the rim, with minimal effort. Motorcycle Tyre Valve Stem Puller – takes the pain (and bloodied knuckles) out of refitting tubes after a puncture/tyre change. The 3 functions of this tool make valve stem and inner tube jobs faster and easier. Heavy Dual Chuck Tyre Pressure Gauge with offset head that reaches tight areas. Bead Buddy – No more fighting to keep the bead down as it holds the tire bead down in the drop center of the rim, simplifying tyre changing. 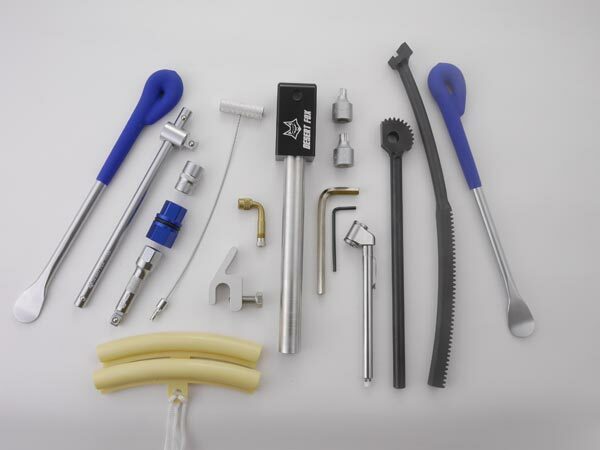 Model specific wheel sockets, torque sockets, hex bits and axle tools included. Only the tools you need for your bike, and none you do not. 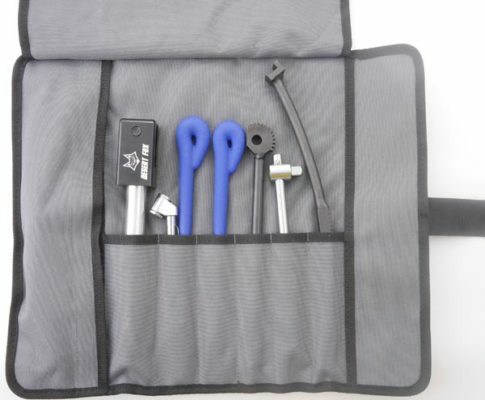 Packaged in a heavy duty water resistant tool roll.